Day 02: Kathmandu, preparing and briefing, stay overnight at Hotel. From the centre of Khadbari a small path leads down to the west. A couple of times you have the choice: flat or down; choose down. 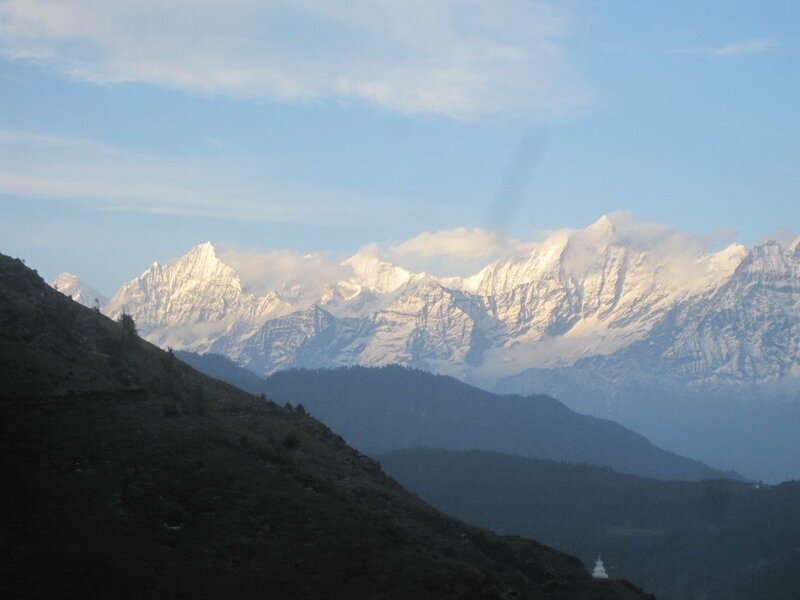 The trail goes down steeply and at several points offers beautiful views of the Makalu range. After about 1 ½ hour you reach a small river with an old wooden suspension bridge (320 m), which you have to cross. Follow the large path (don’t take the small path going up), which follows the Arun River in northwest direction. It is flat, easy walking. 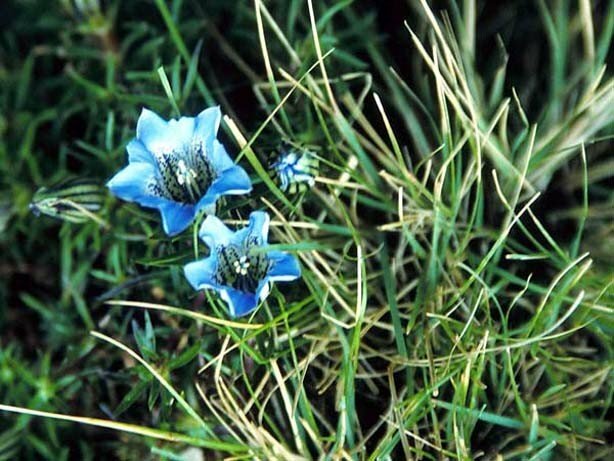 After about 20 minutes you pass 2 teashops, from which it is another half hour to the village of Chewabesi. There are a few restaurants, where you can stop for lunch. From Chewabesi the trail continues for another 45 minutes, till you reach a big suspension bridge over the Arun River, which you have to cross. At the other side you arrive at the village of Kattike Pull. 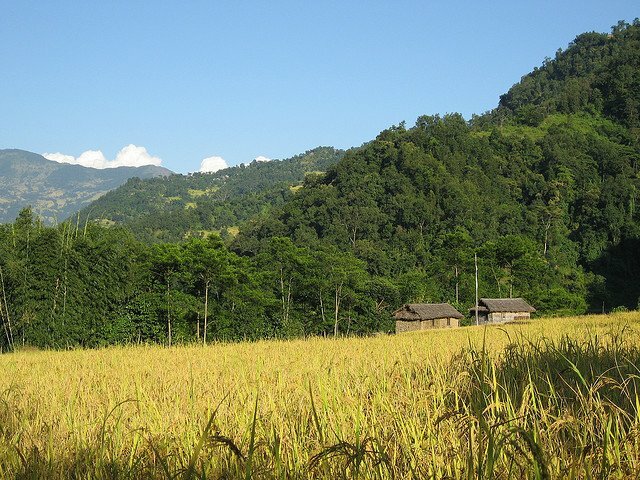 The scenery is very idyllic, with the spread out houses, rice fields and the beautiful Arun River to your right. At the end of the village you cross a blue iron bridge, after which you have to climb steeply for about 15 minutes. The trail keeps on following the river, which is now far below you and climbs gradually. After about 45 minutes, you reach a road, which you follow for 100m, after which you take a small part to your right. You reach a Y-junction, take the left fork up. It is a nice walk through the countryside again, with beautiful views of the Arun Valley below you. After about half an hour you reach the small settlement of Majuadanda. 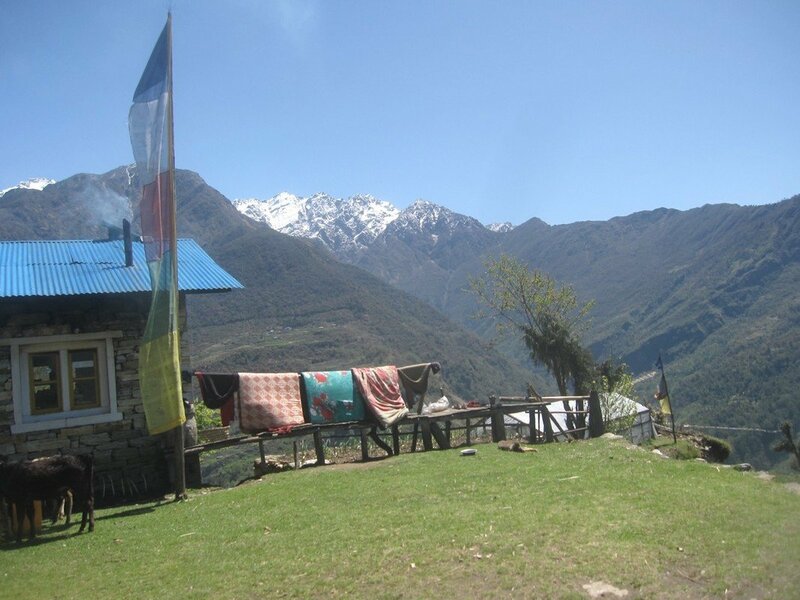 Majuadanda has a small guesthouse with 3 rooms and a place to camp: Sagarmatha Hotel and Lodge. 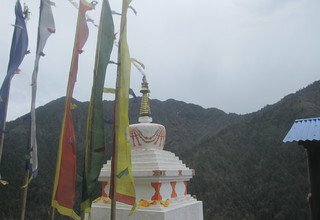 Today you enter the Solukhumbu section of the GHT (with respect to the GHT map of Himalayan Maphouse), although you only enter Solukhumbu the next day, when you cross the Salpa Pass. It is quite a long and tiring day (total distance is 22.4 km) and you can chose to camp earlier. 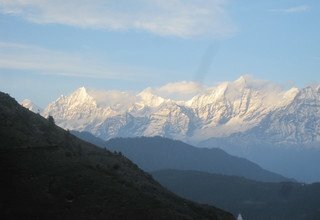 Leaving Majuwadanda, the trail goes up, sometimes steeply and other times rather flat, offering views to snowcapped mountains of the Makalu range at the horizon. After about 30 minutes there is a Y-junction, take the left trail. 15 minutes later there is another Y-junction (2 small trails), take the right trail here. The trail is going down now, mostly gradually, but at some points pretty steep as well. Now and then you pass a small settlement, like Chalishe and Tabutar. Besides terraced countryside, the walk also goes through subtropical jungle. You might meet men with huge loads, about 2 times the size of the person carrying it. They are carrying Himalayan medicinal herbs, destined for the Chinese market. About 2 hours after the start of the walk, you arrive at a small river, which you have to cross. 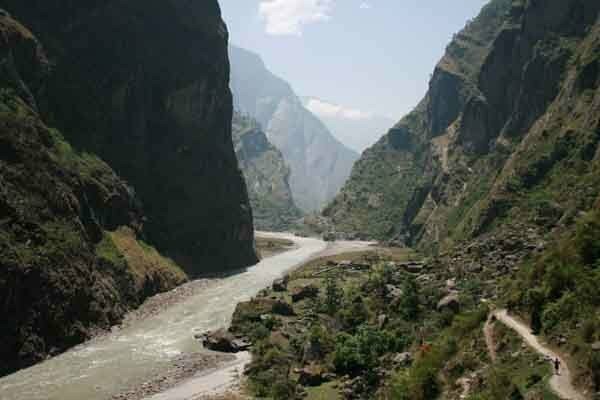 This brings you at the side of a big river, Liknuwa Khola, which you will be following upstream for the rest of the day. You walk at the left side of the river. After 10 minutes, you arrive at a small guesthouse with a campsite, Kulung Kirant Hotel (2 very simple rooms). After another 10 minutes, you have to cross a big iron suspension bridge, close to the village of Tabutar. Continue your walk at the right site of the river (don’t take the path going up). The trail is so called Nepali flat: lots of flat parts with some steep climbs and descends. About 15 minutes later you arrive at the small settlement of Gothe Bazar, which has a weekly market at Tuesday. There is a teashop, which can be a good lunch stop. Just after the teashop, there is a suspension bridge. Don’t take that bridge, keep on following the river in westwards direction. 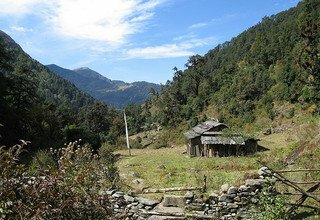 The trail is Nepali flat again, with some steep ascends, passing tiny settlements like Lankuwa. After about an hour, there is another suspension bridge, which you have to cross. You keep on following the river, which is at your right now. Sometimes you see a trail going up, away from the river, don’t take these, just keep on following the river. After 45 minutes, there is another suspension bridge which you have to cross. Shortly after crossing, there is a Y-junction, take the left trail, going up. 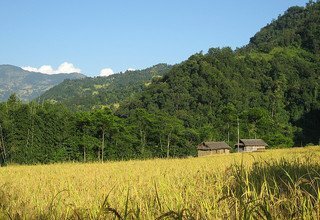 You are walking again in subtropical forest, with now and then a small settlement surrounded by terraced agricultural land or a teashop where you can stop for tea. The trail is most of the times ascending. About 2 ¾ hours after the last suspension bridge, you arrive at the village of Tendo, which has a school, which you could use as a campsite. Shortly after Tendo, you have to cross a self-made small bridge over a wild flowing river. Although you are at around 1400 m only the landscape here reminds to high altitude landscape. 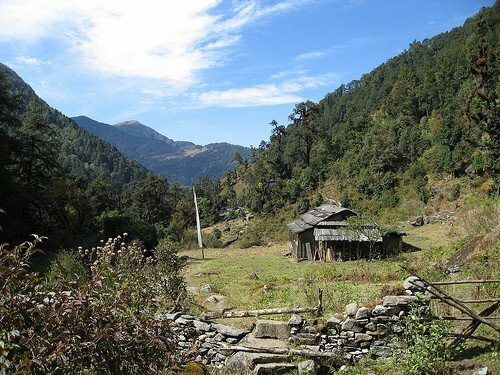 It’s another good half hour walking to the Rai village of Salpa Phedi, where are a few guesthouses and campsites (2 guesthouses next to each other are Hotel Irkhowa and Lodge with 3 rooms, and Sherpa Hotel and Guesthouse, which has 2 rooms and a dormitory). This is also a long stretch. The distance is only 14 km, but you have to climb about 1800 m, till the Salpa pass, at 3340 m, after which you descend 500 m. It is beautiful to see the landscape change as you get higher: you start among rice fields, passing small settlements, climb into forests, which turn into bushes, and higher up you walk through dense rhododendron forests. 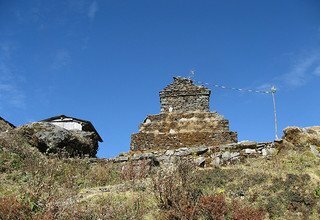 After about 2 hours you reach the Sherpa settlement of Thulophokte (2286 m), which has a guesthouse (Kalopatar Hotel and Lodge; 2 rooms, campsite available), which is a good place for lunch. 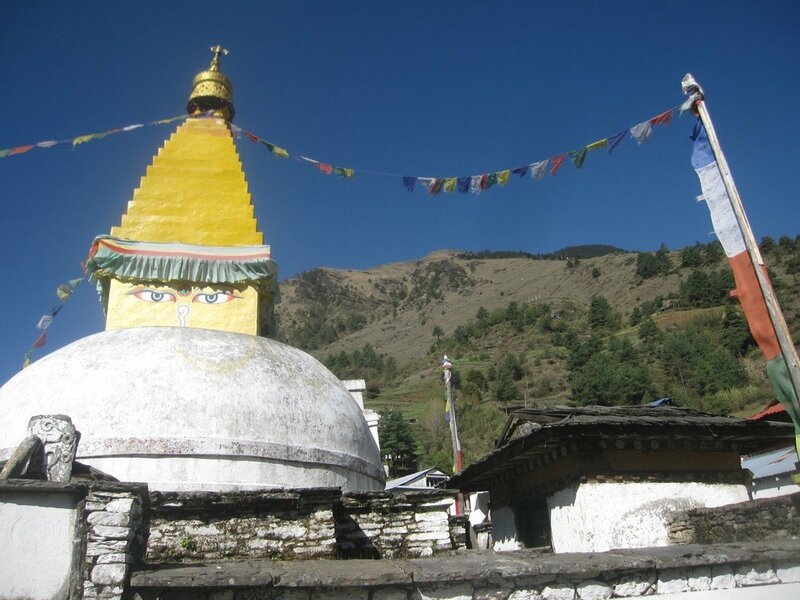 Thulophokte has a small Buddhist monastery, Chochen gompa, belonging to the Gelugpa sect. Ask the people in the house next door for the key! 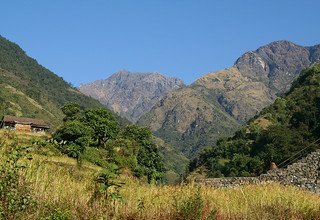 About 2 hours after Thulopokte you reach a small guesthouse with camping facilities, Salpa Pass Hotel and Lodge (2936 m). If you don’t want to go all the way to Sanam, this is the place to stay. From the guesthouse it is about 1 ½ hours to the Salpa pass (3340 m). You notice that you are arriving by the beautiful mani walls (walls with stones with Buddhist prayers and drawings carved on them). With good weather you have a good view from the pass to Mount Dudh Kunda (6465 m). 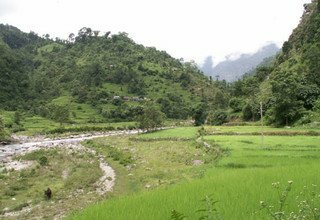 The Salpa Pass brings you into Solukhumbu. From the pass you can go to Salpa Lake (3414 m), which is about an hour walk, and the Shilicho viewpoint (4158 m), about 2 hours walk. 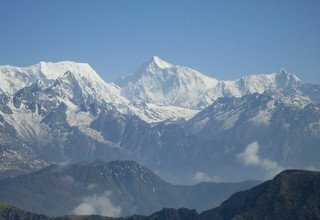 From this viewpoint you have a spectacular view of a large part of the Himalaya Range: Mt Kanchenjunga, Makalu, Mera Peak and Everest, among others. From Salpa Pass it is about 2 hours descending through beautiful pine and rhododendron forest to Sanam, a small Sherpa village. After 1 ½ hour you pass the small settlement of Huaca. Shortly after Huaca there is a Y, take the right trail going up (for a while) here. The trail descends slowly till Sanam. Sanam has one lodge next to the monastery: Gomba Lodge (4 rooms and 2 dinings). Besides there is a small local guesthouse without a name next door. Today it’s a long descend of about 1500 m till 1350 m, and a tough climb of 1200 m, to Khiralule at 2535 m. From Sanam the trail goes down through rhododendron forests, passing some mani walls. With good weather you can see the snow capped Mt. Numbur (6959 m) at the horizon. 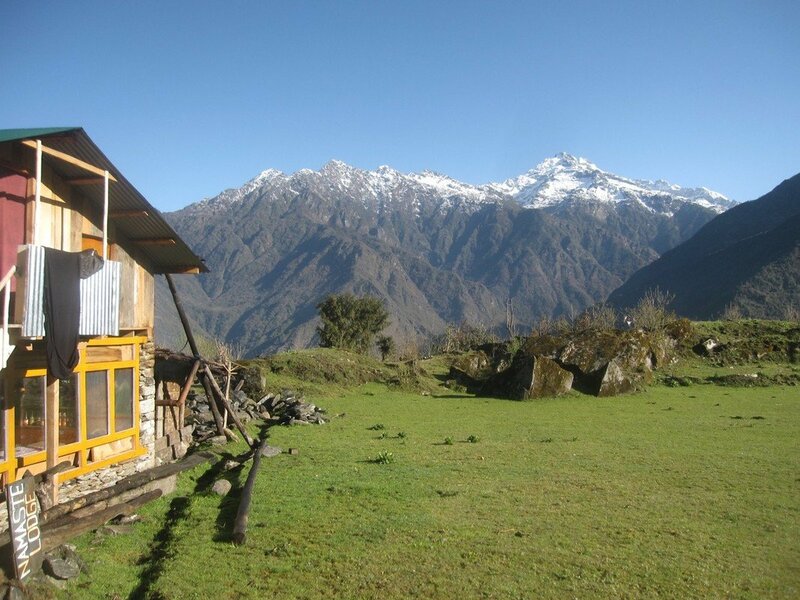 After 45 min you pass a small lodge where you can camp as well, the Arun Valley Lodge and Tine Sherpa Hotel (1 room and dining, shop and camping facilities). Shortly after passing a huge mani stone and wall, there is a Y-junction, take the right trail, going flat. You pass the small settlement of Siare. After the last house, the trail continues to the left, going down. 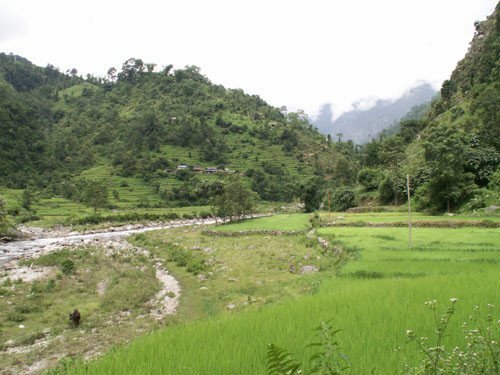 About 2 ½ hours after having left Sanam, you reach the big village of Gudel (2042 m), which is mainly inhabited by Kulung Rai people. 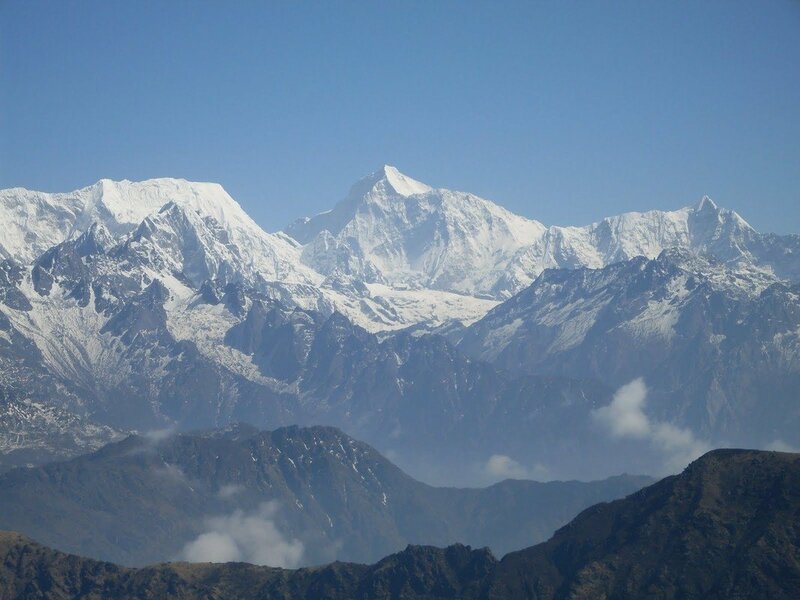 From here you can see Mera Peak(6476 m) and Mt Chamlang. In Gudel are 2 small lodges, Namasté Lodge and Restaurant (4 rooms/11 beds and a campsite); and Kapila Guesthouse (no campsite). Take the path that is following the stream downwards through the village. It is about 1 ½ hours further down to the bridge over the Hongu Khola at 1350 m. After crossing the bridge, the only way is up for the next couple of hours! After about 15 minutes, you arrive at the village of Bung, which is spread out over the hill. Very soon, you arrive at a small guesthouse, Sagarmatha Lodge (2 rooms; 1 with double bed, 1 with single bed and shop; tel 9753007158). It takes about an hour to climb out of the village. You pass the National Park office of Makalu Barun National Park (which was closed when we passed). 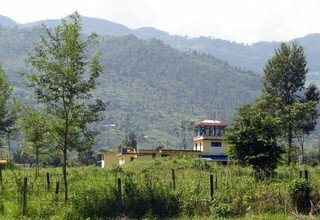 At the top of the village there is one more lodge, Panch Pokhari Lodge and Restaurant and campsite (9842904672). The trail keeps on climbing through forest and agricultural plots, passing small settlements once and a while. After about 2 hours you reach Khiraule. 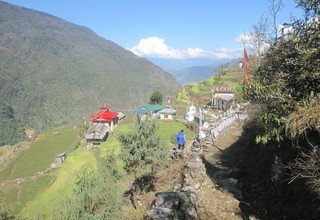 You pass a school and an iron bridge, from where you have to climb further till you reach a lodge with campsite, which is situated next to a Buddhist monastery (Himalayan Lodge, 3 rooms, dining, campsite (2535 m). Summary of the program of today: climb till the Surke La (also called Charakot pass) at 3070 m, then go down more than 1000 m till the Inkhu river (1985 m), then go up again 800 m to Sibuche (2800 m). From Himalayan lodge, follow the small trail up the hill behind the lodge. The trail comes out to some stone steps, leading to a trail through rhododendron forests. You pass a beautiful stupa with a few mani walls and continue through the forest. You are surrounded by forested hills as far as you can see. The trail passes the small settlement of Charakot. 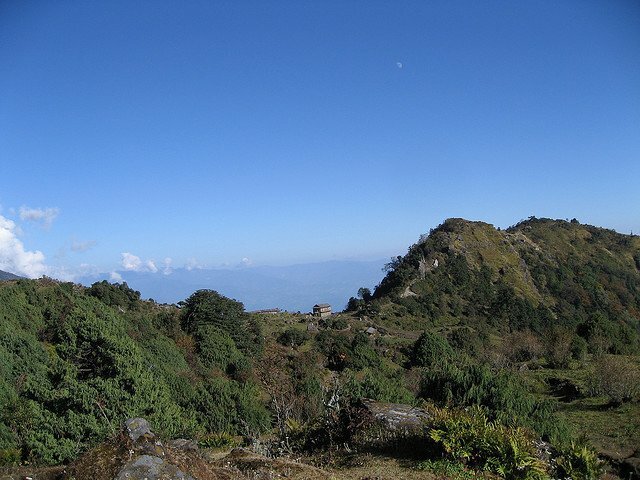 From here you can take a trail in northeast direction to Panch Pokhari, a beautiful mountainlake (6 hours). The GHT continues in western direction however, leading to the Surke La/Charakot Pass at 3070 m (about 2 hours from Himalayan lodge). 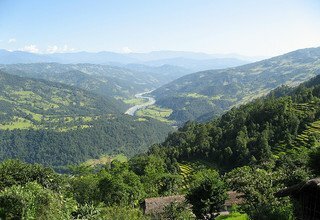 From the pass a steep path leads you down through rhododendron forests again to the village of Najingdingma (1 hour; 2700 m). The village is surrounded by grass fields where people of villages higher up take their yaks to graze in summertime. 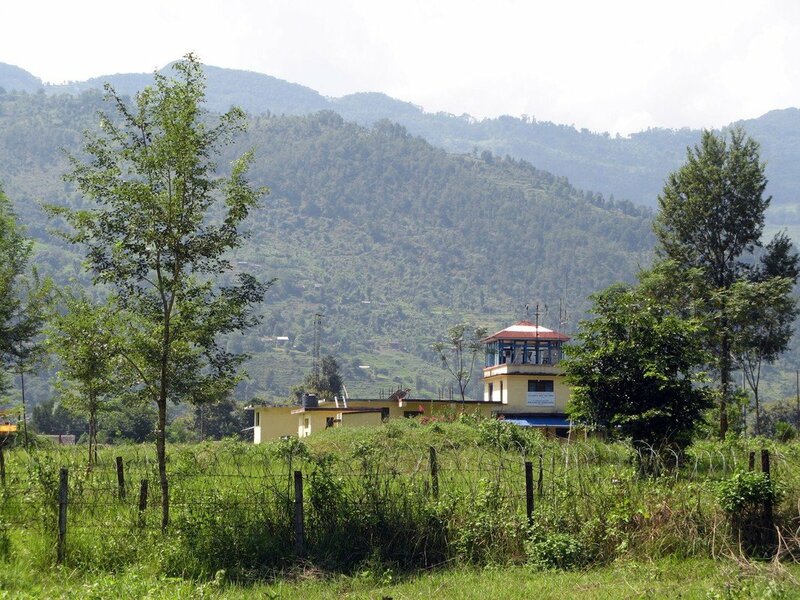 In Najingdingma are 2 guesthouses, Sherpa Guesthouse (2 rooms) and Namasté Lodge and camping (4 rooms). 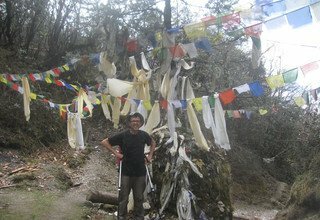 From Najingdingma continue over a small trail which is steeply going down through the forest. After about 1 ½ hour you reach the wild flowing Hinku river, which you cross by a suspension bridge high over the river (1985 m). After crossing the bridge, the trail goes steeply up again. After about 10 minutes you reach a small lodge, Mera Peak Lodge (only dining for sleeping). After about 1 ½ hour you reach (the start of) Sibuche (2555; here is a small guesthouse without a name). It’s another half hour climbing till the end of Sibuche (2800 m). There is another lodge here, Namasté Lodge. From the lodge you have a splendid view of Mera Peak. Between Sibuche and Paiya there are 2 passes to cross. Most of the day you are walking in the forest, with now and then a small settlement. From the end of Sibuche, ittakes about an hour walking to the first pass, Narkung La (also called Chaduk La) at 3161 m. From the pass you have a beautiful view of Mt Numbur (6959 m). After the pass, the path goes down steeply. After about 15 minutes the trail comes to a T, with a mani wall behind it. You have to go left here. After another 15 minutes, you reach the small settlement of Pangoam, which has a small lodge (New Panorama Lodge). At the end of the village, the trail bends to the left. This trail goes to Kharikhola. If you want to go to Lukla, don’t go left here, but go straight: take the steps that lead to the courtyard of a house, pass the courtyard and then continue the trail, going down. You pass another lodge, Trekkers Lodge. The trail continues descending through the forest for another 1 ½ hours till you reach a small wooden bridge at 2400 m. From here the climb to the second pass begins. It’s a beautiful trail through the forest, high on the slope, with views of Mt Numbur. 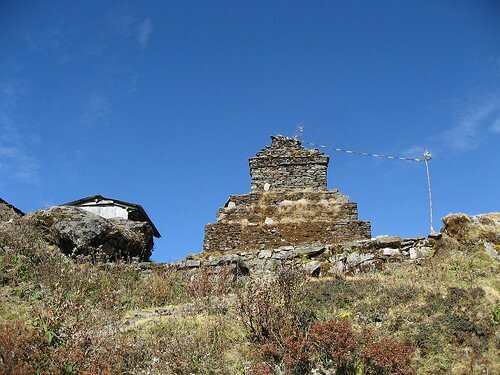 After an hour, you reach another lodge, Sherpa Lodge (with camping facilities). 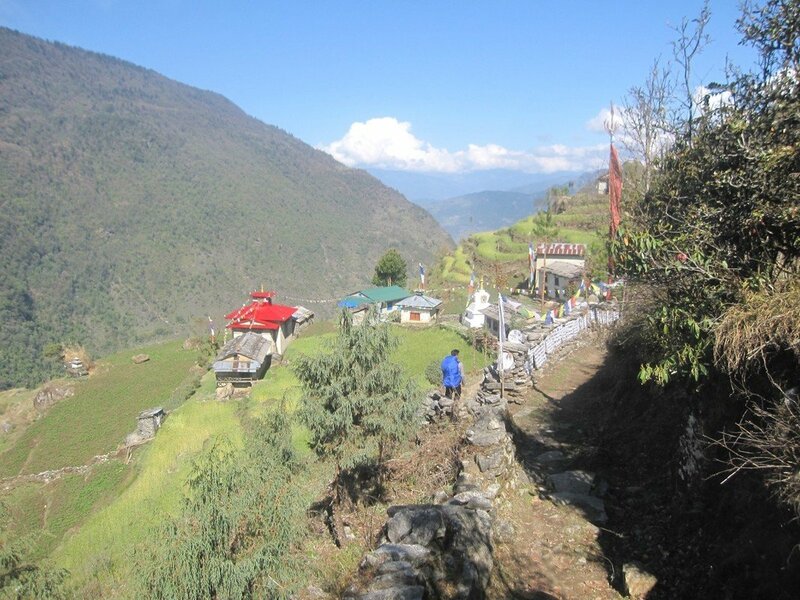 Shortly after, there is a simple guesthouse, Makalu Hotel, after which a trail goes down. Don’t take this trail, keep on the trail which is going up. After about 1 ½ hours you reach the second pass of today, Kari La, at 3059 m. With good weather you cannot only see Mt Numbur, but also the Dudh Khosi Valley up till Namche Bazar and even the Cho Oyo (8188 m). The trail goes down quite steeply again and after 30 minutes joins the main trade route from Kharikhola, and the famous Jiri-Lukla trekking trail. Follow the trail in northern direction. After about an hour you reach the village of Paiya. 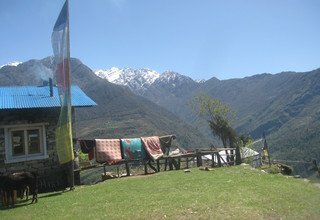 In Paiya there are 5 lodges, Sherpa Guide Lodge, Apple Pie Lodge (both have camping facilities), Beehive Lodge, Himalaya Sherpa Lodge and Trekkers Lodge. You can notice that you are on a more touristy area by the good facilities: all lodges have a hot shower, a warm dining, clean rooms, with beds with soft mattresses, shops, recharge possibilities, and an extensive menu! This is quite a short day. You walk mostly through the forests, meeting many lodges along the way. 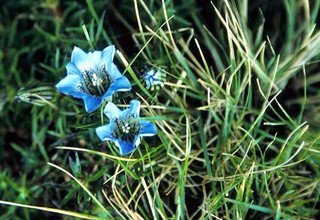 The day starts with a gradual climb of about 1 ½ hours, after which the trail goes down steeply for about 45 minutes to Surke (2290 m). Along te way you have beautiful views of rugged snowcapped mountains, like Khumbi Yul La (5761 m), Khongde (6168 m), Numbur (6959 m) and Kusum Khangaru (6367 m). Shortly after Surke, you cross a bridge at 2276 m, which is the lowest point of today. 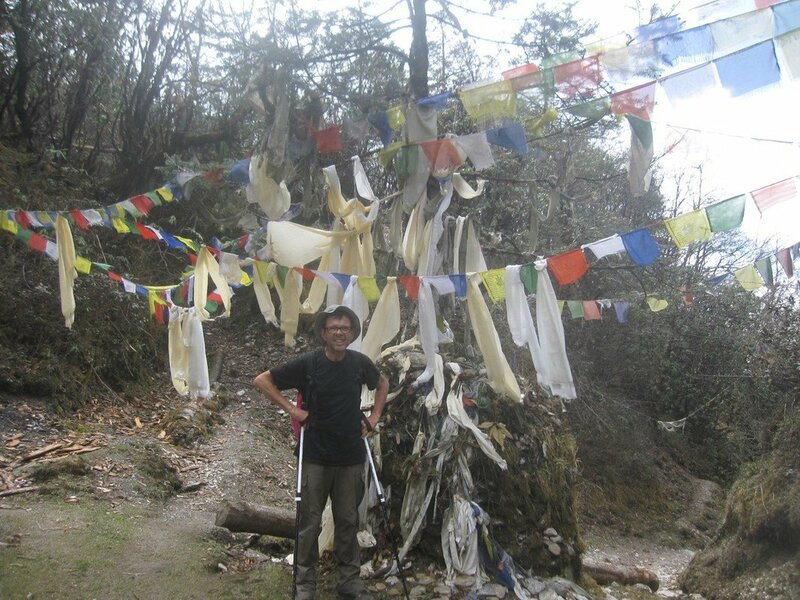 From here it is a long but steady climb of about 1 ½ hours to Lukla (2840 m). 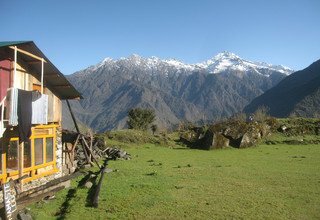 In Lukla there are plenty of lodges in all categories. Besides you find shops, bakeries, email café’s and bars and even discotheques here. 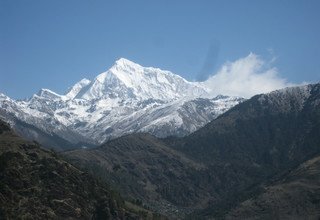 Lukla is the starting point for many treks in the Everest Region, like the Everest Base Camp Trek, the Gokyo Lake Trek (or a combination of these 2) or the trek over the Tashi Labsta into Rolwaling. Besides, it is the starting point for many climbing expeditions, the most famous one to Mt Everest (8848 m). 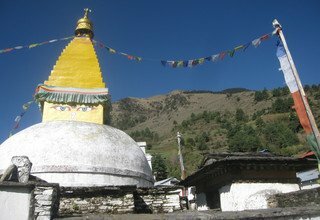 Those who want to end their trek, can fly to Kathmandu from Lukla. Day 11: Fly from Lukla to Kathmandu and transfer to Hotel. * Flight ticket from KTM/Tumlingtar and Lukla/KTM and domestic airport tax.